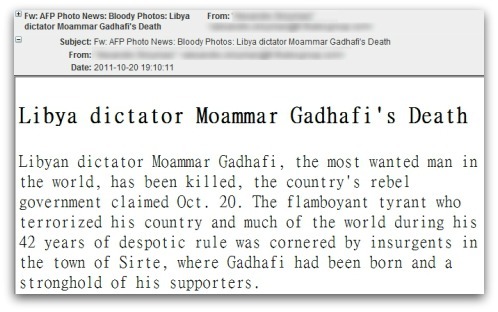 Malware Attackers take advantage of The death of Libyan dictator Colonel Gaddafi to spread malwares.They have spammed out an attack posing as pictures of Gaddafi's death, tricking users into believing that they came from the AFP news agency and are being forwarded by a fellow internet user. Libyan dictator Moammar Gadhafi, the most wanted man in the world, has been killed, the country's rebel government claimed Oct. 20. The flamboyant tyrant who terrorized his country and much of the world during his 42 years of despotic rule was cornered by insurgents in the town of Sirte, where Gadhafi had been born and a stronghold of his supporters. If windows users opened the attachement, it will lead to infection of your system. Sophos anti-virus products detect the malware proactively as Mal/Behav-103.